This is it. The zombies are almost at the door. Will you be able to learn what's needed in order to stop the Telus World of Science Edmonton (TWOSE) from being overrun by zombies? Time is running out, and only a few spaces are left for TWOSE's the Science of Survival Zombie Apocalypse scenario this Saturday, June 3. The 6:30 and 8:30 time slots are all sold out, with a few openings left for the 10:30 pm spot. Let TWOSE help prepare you and your loved ones to survive. 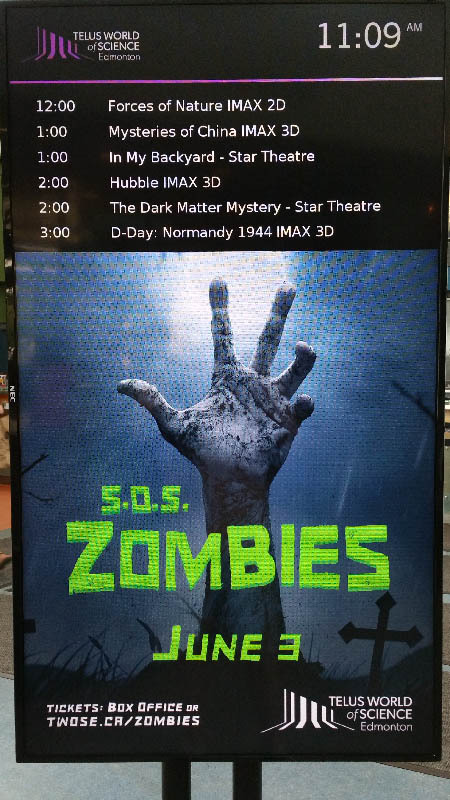 Click on the TWOSE schedule board below to go to the S.O.S Zombies page to see availability and order tickets. The Apocalypse is approaching. Are you ready? It is vital that all members of the uninfected arrive on time to the TELUS World of Science – Edmonton training sessions. You must be registered by 6:30pm. Training cannot be delayed! The Zombies can arrive at any time. -Arrive 15 minutes prior to your scheduled training. -Your online wavier must be submitted prior to Saturday, June 3. - no weapons or face masks will be allowed. Will you survive or is this truly the end as we know it?